There’s a creative tension between tradition and innovation at the heart of all good electronic music. 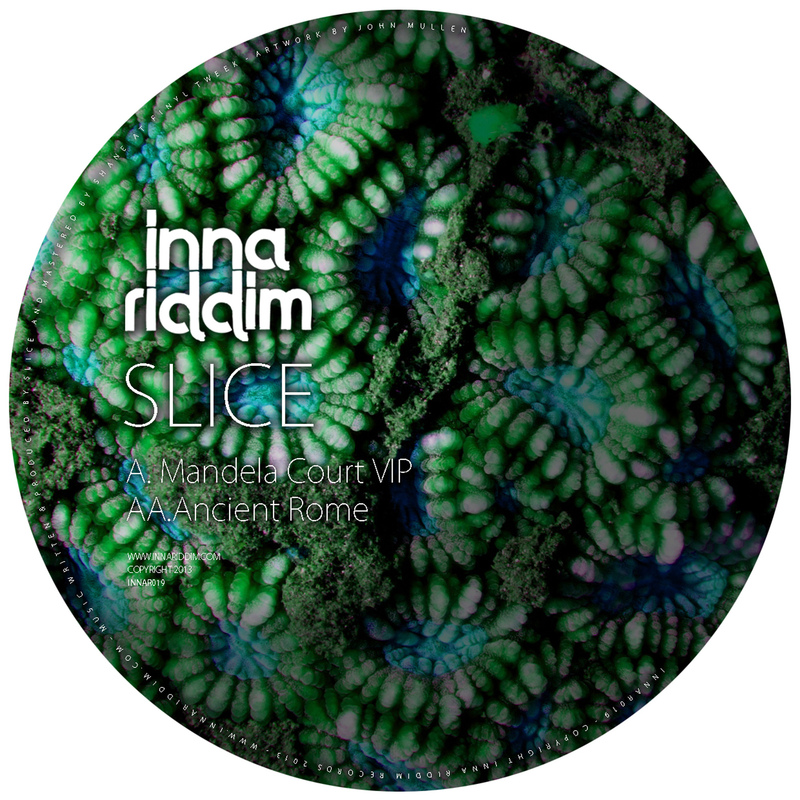 Slice’s latest release on Inna Riddim Records derives its energy from that same tension, poised Janus-faced between its junglist roots and the up-to-the-time contemporary production values of the present day. ‘Mandela Court VIP’ is the lower-key of the two tracks, starting with a boom-bap beat emerging from a hiss of hihats and metallic claps. A nostalgic evocation of past rave culture permeates the whole tune, not just in the chopped-up amen workout that viscerally recalls the heyday of jungle despite its contemporary 130 BPM tempo, or the ravey keyboard riff running beneath the main pale, sonorous synths, but most explicitly in the vocal sample from a late great drum&bass MC, foregrounded in a way that marks out the track as a elegiac homage to a moment in time seminal for the whole of today’s bass music scene. In an utterly different take, ‘Ancient Rome’ opens up with nasty, ominous FX reminiscent of late 90s dark drum&bass, and begins with a big upfront break, chopped and oscillating forward and back, while another classic vocal sample demands ‘junglists are you ready?’ Yet the bass, when it drops on the off-beat, has the classic grime sound of the early 00s, drawing in another strand of influence while the beats rattle forward with a tumbling, unstoppable energy, as if it’s on caterpillar tracks. For all its greater exuberance and more aggressive rhythm (this is the one to dark up the floor with), ‘Ancient Rome’ is no less intensely engaged with the past, both as homage to tradition and, more ambiguously, a glimpse back into the glory days of a lost empire that has crumbled into history. *In honour of the late Stevie Hyper D, all proceeds from this release will be donated to the British Heart Foundation.